The original band members were Ron Wilson (drums), Jim Fuller (Lead guitar), Bob Berryhill (rhythm guitar) and Pat Connolly (bass). Saxophone player Jim Pash joined after their "Wipe Out" / "Surfer Joe" recording sessions at Pal Studios. Ken Forssi, later of Love, played bass with The Surfaris, as well as Jack Oldham, who performed with the group from 1966-1967, including a performance at the 1967 Grammy Awards. Wilson's energetic drum solo made "Wipe Out" one of the best-remembered instrumental song of the period. "Wipe Out" is also remembered particularly for its introduction before the music starts, a cracking sound (imitating a breaking surf board), and a maniacal laugh followed by the only two words of the song, "wipe out". "Wipe Out" is often regarded as being the surfing anthem. "Wipe Out" was written in the studio by the four original members (Berryhill, Connolly, Fuller, Wilson), and was originally going to be titled "Switchblade". The band released a series of records, with two other singles, "Surfer Joe" and "Point Panic", having an impact on the charts. Point Panic is a renowned surfing venue in Hawaii named after the song. 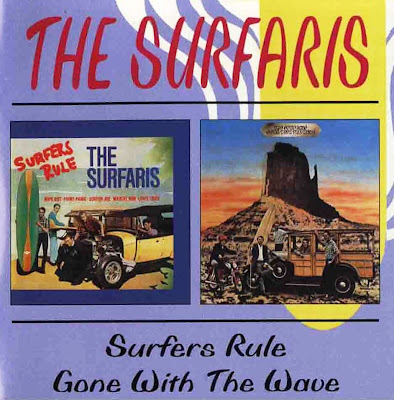 The Surfaris disbanded in 1966 but have periodically reunited and are still active as of 2008, performing and recording, often re-recording their old and new songs. They still perform as Bob Berryhill's Surfaris and Jim Fuller's Surfaris (two separate groups) all over United States and Europe with a large fan base. Following the death of television personality Morton Downey, Jr., news reports and obituaries incorrectly credited him as the composer of "Wipe Out" (as well as The Chantays' "Pipeline"). As of 2006, Downey's official website continues to make this claim. Drummer Ron Wilson died on 7 May 1989, one month short of his 45th birthday. Wilson had released an album of his songs, entitled Lost It In The Surf, on Bennet House Records of Grass Valley, California, which was recorded in June 1987. A very small number of cassettes of this album were produced. Lost It In The Surf included a cover of "Louie Louie", complete with Scottish bagpipes. "Wipe Out" featured in the film, Dirty Dancing.